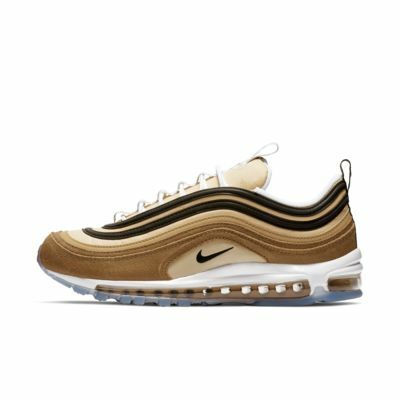 The Nike Air Max 97 Men&apos;s Shoe keeps the sneaker favourite going strong with the same design details that made it famous: water-ripple lines, reflective piping and full-length Max Air cushioning. I ordered the shoes based on the pictures and when I had seen them on other people, but when I opened the box, I was surprised because they were actually pretty ugly. Like I said, I was very surprised because they looked so good in pictures. They are also very narrow which is not a bad thing if your feet are the right shape but it is something that people should be aware of. I've never really like the styling of the AM 97 but the all black nocturnal colorway is by far the one that did it for me. The black takes away from the wavy design look and placed on the white sole gives it a more sleeker look. I would say they run big because I wear a 9 but picked up these in 8.5 and they fit great. They are not the most comfortable so these are definitely good for casual wear. Couldn't be more happier...so glad they re-released these in April because it took me 21 years to finally cop a pair!